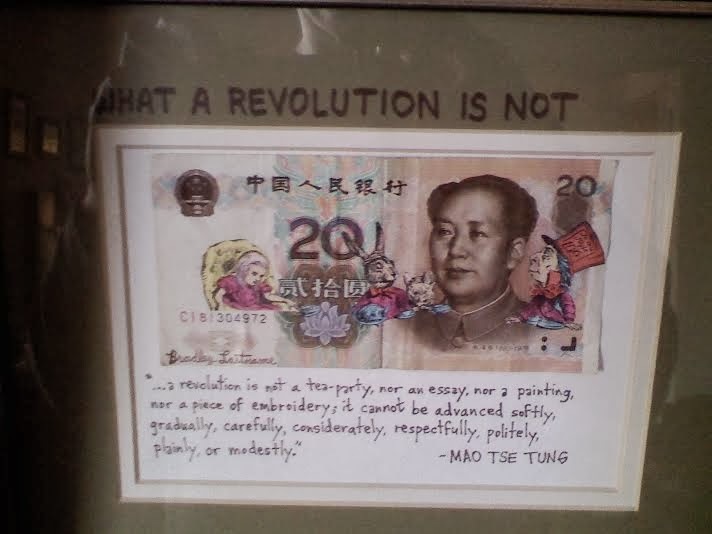 I wonder if it is a federal crime to deface money in China. I'd like to have more art in my study. But I have some. This piece is by Surrealist Bradley Lastname. I have other pieces by Andrew Davis, Jesus Correa, and Jenny Mathews. Then I have a few of my own Poopsicle paintings. For a lot of this day I've been trying to get VHS tapes back into the boxes they belong in. I frequently regret as we drive past buildings that used to be video stores that only a few years ago these stores were basically giving people money to take VHS tapes out of their stores. Also, I see people paying more than what would have been full price twenty years ago for vinyl records. I can't bring myself to take it seriously that I might oneday buy albums I bought when I was fifteen years ago again on vinyl. The train is gone.